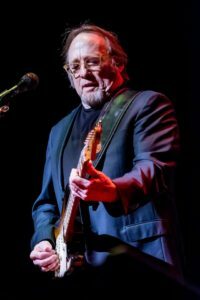 It felt like a warm evening with old friends Saturday at the Park Theatre in Cranston, RI, as Stephen Stills and Judy Collins played a memorable show of originals, covers, and few new ones before a sold-out crowd. The warmth from the legendary performers was evident, on stage together and among those assembled fans, many of whom first listened to the pair over 50 years ago. The show came just days after the release of their new album, Everybody Knows, a charming collection of songs that showcases the best of both artists. The show opened with one “for Tom,” Stills noted, the Traveling Willburys hit “Handle With Care,” a tune that was actually a part of their setlist before Petty’s untimely death earlier in the week. The song, which is also found on their new album, was a nice duet. In fact, the show featured several from the new release, including remakes of the lovely Manassas tune “So Begins the Task” and the Buffalo Springfield hit “Questions.” In many ways, the concert served as a retrospective of their careers, as they covered songs from about a dozen bands and artists. Collins was exquisite on Leonard Cohen’s masterpiece “Suzanne” (one of the greatest folk songs ever written), as well as on “Everybody Knows,” the title of the new album. Between songs, she told stories of how Cohen shared his songwriting with her in New York City in the ’60s – the combination of his lyrics and her voice is unparalleled. Collins started off her career covering others’ songs and grew into a songwriter later. 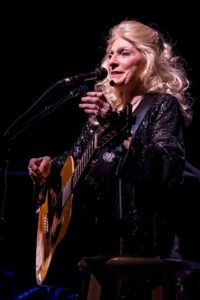 She sang a beautiful version of the Sandy Denny classic “Who Knows Where the Time Goes.” Another favorite, the Joni Mitchell-penned “Chelsea Morning,” was superb, introduced with the story of how the Clintons named their daughter after the hit song. Stills brought a few of his own to the show, and covered Dylan’s “Girl From North Country,” a song that entered his set list while on tour last February in Northern Minnesota. He also played “Judy,” one of several he wrote about his co-star. The encore featured the lesser known “Houses,” a song Collins wrote about Stills. Indeed, their love affair yielded several classics, and the show closed on the most well-known of those – “Suite: Judy Blue Eyes,” originally done by Crosby, Stills and Nash, and still a clinic in folk-rock songwriting. Let’s be honest, it’s a great night of music when you can hear the author (Stills) of one the greatest “confessional” love songs ever written harmonizing with the subject of that song (Collins), with Stills noting wryly “The secret to our chemistry is that we both married other people.” Full circle indeed. Of course, the show’s message was political at times, including a shout out to a Canadian fan, “where you have health care,” remarked Collins. But the core of this show from these two legends seemed to be one of mutual admiration, between the two who remain close friends after a star struck romance – a moment in time 50 years ago.